38 photos of the restored Visegrad - Mokra Gora 76cm gauge railway. 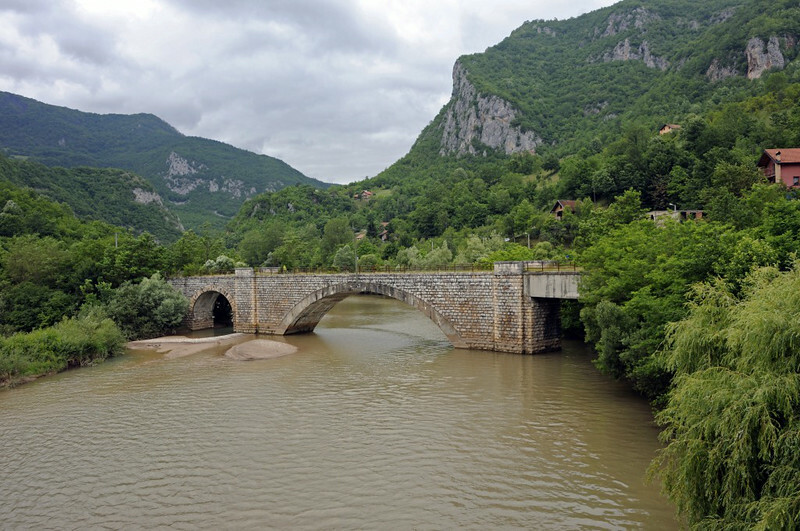 Disused railway bridge, Ustipraca, Bosnia-Hercegovina, Sat 14 June 2014. Looking north. The bridge used to carry a branch from Foca to Ustipraca (right), opened in 1939 in Yugoslav times. The branch was extended to Miljevina in 1952. At Ustipraca the branch joined the Austro-Hungarian Ostbahn (Eastern Rly) from Sarajevo to Visegrad and the Serbian border at Vardiste, opened in 1906. The bridge crosses the River Praca at its confluence with the River Drina. The water level has been raised since the bridge was built by a hydro-electric scheme on the Drina.